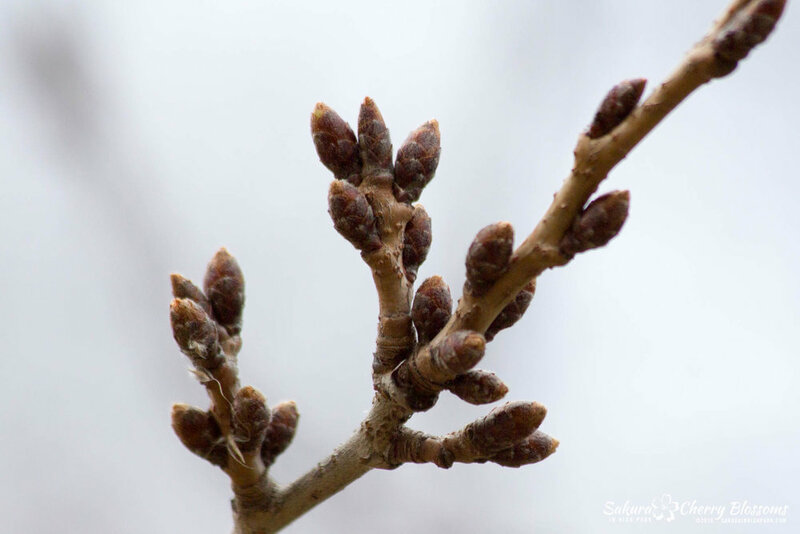 Sakura Watch, April 2, 2016 - Cold weather keeps buds closed for now as the sakura cherry blossom trees in High Park are subjected to another below zero week. In fact, there was even snow in the forecast! Mother nature is continuing to put a hold on spring, but I know you are all wondering what does this mean for the sakura cherry blossoms? Good news is the buds are all still in their early stages and closed tight so they should stay protected from these freezing temperatures. The bad news is the cold winter weather is supposed to continue throughout the week which could then possibly slow down the blossom development and push the bloom dates out a little longer into the first week of May and possibly be around for Mother's Day (as in previous years). Judging the by the photos taken today, a few sakura cherry blossom buds are beginning to show a few green tips - a sure sign of the stage 2 development cycle - though there's hope they are still protected enough not to be harmed by the freezing temperatures. Taking this wintery weather week into consideration, I'm now going to begin predicting the bloom dates will be moved out to between May 5-12, 2016. Of course, these dates could still change if we get good weather that helps to encourage the trees to bloom sooner, but as I keep watching the trees over the weeks ahead, I'll be able to predict the bloom dates more accurately. So keep checking back on the website and for best dates! Enjoy the rest of the weekend!